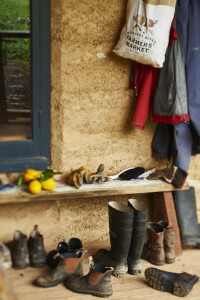 The AFMA national BOOTS FOR CHANGE 2016 campaign has been highly acclaimed at the 2017 Philanthropy Australia Awards winning SPECIAL MENTION in the BEST SMALL GRANT category (under $50,000). 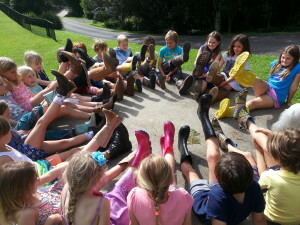 In fact the FRRR Grant to AFMA to create the BOOTS FOR CHANGE campaign was $10,000. 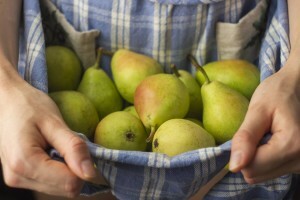 That seed funding (and leveraged philanthropic partnerships) was deployed to create a national campaign to raise awareness of farmers’ markets and the beneficial role they play in supporting Australian farming families. 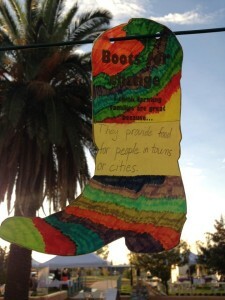 ‘The impact of BOOTS FOR CHANGE was simply astounding. 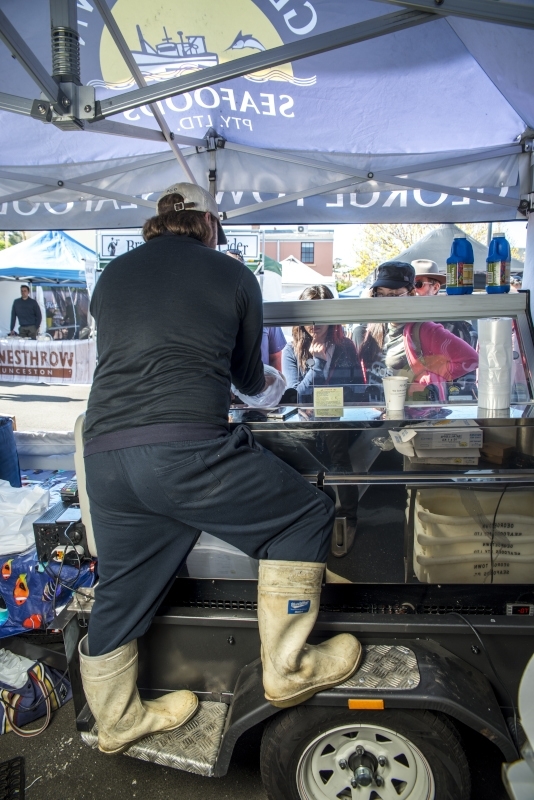 The total national spend at these markets tallied more than $17 million. The social media coverage reached an audience 0f 1.75million Australians. At least 48% of markets reported increased shopper numbers as a result of the campaign, and 99% of market managers were extremely satisfied,’ said Boots For Change project manager, Jane Adams. 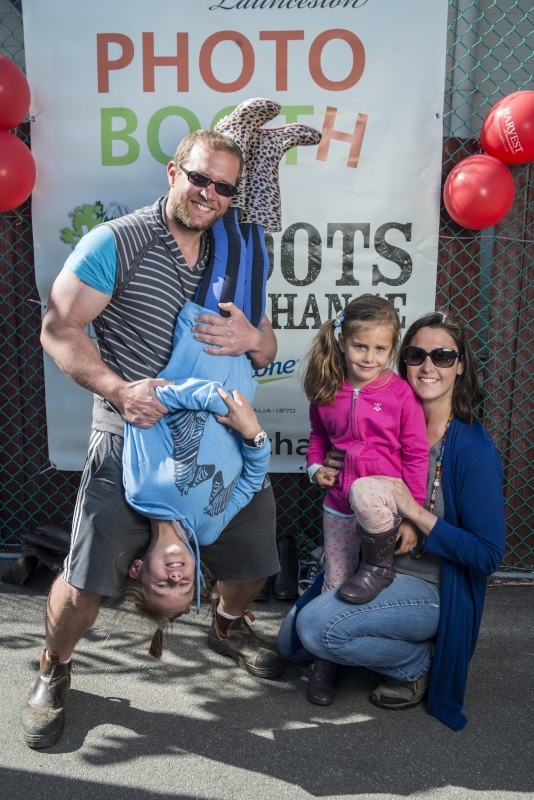 BOOTS FOR CHANGE Market Days ran throughout April 2016 in 56 farmers’ markets Australia-wide. 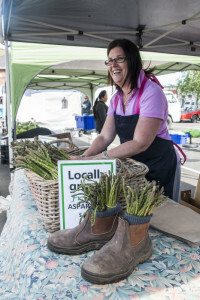 The campaign hosted a total of 96 markets that engaged 3000-plus farmer stallholders and reached 180,000-plus shoppers in all states. 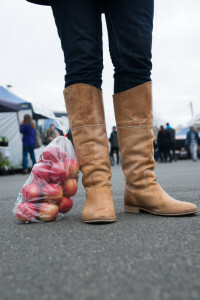 The national 2016 BOOTS FOR CHANGE campaign run by the Australian Farmers’ Markets Association throughout April delivered major benefits to the farmers’ market sector. AFMA spokesperson Jane Adams believes the campaign’s success was due to its inherent simplicity. 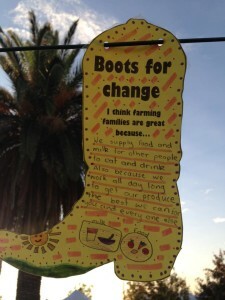 ‘Boots For Change originated as an ABC Heywire concept, a simple gesture of pulling on boots to express solidarity with Australia’s farmers, and this resonated widely. ‘Market managers actively embraced the idea. 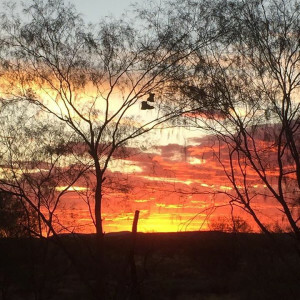 Their imagination and efforts achieved amazing results and struck new supportive community relationships, especially in rural and regional towns where people certainly know how to kick up their boots. ‘The campaign’s multi-million dollar stimulus to the farmers’ market sector is all the more significant given the fact that the original Foundation for Rural & Regional Renewal (FRRR) project grant was $10,000,’ she stated. 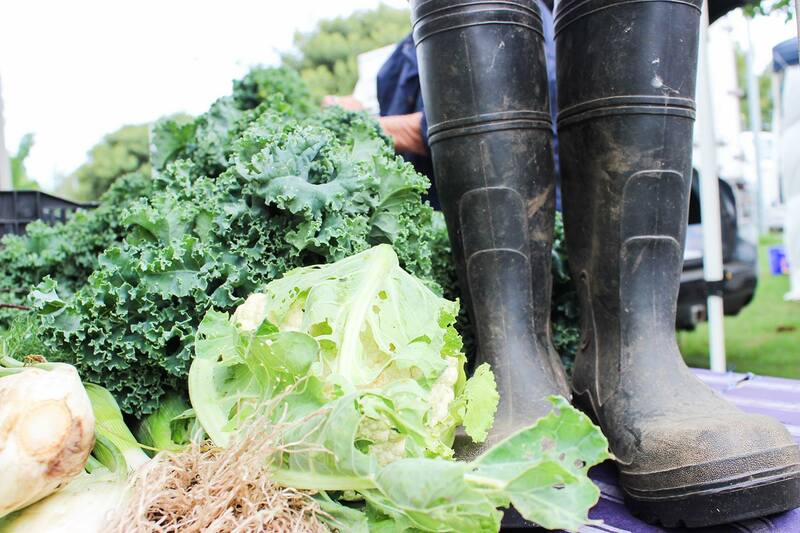 The campaign analysis and economic impact data has been generously conducted by market research agency Colmar Brunton and is based on surveys of over 50 participating farmers ‘markets. 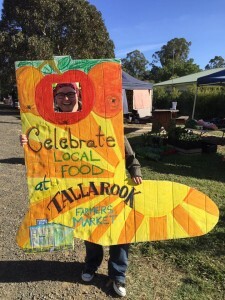 ‘It was great to work on a project that provided such a positive outcome to farmers markets across Australian communities. We look forward to seeing the Boots For Change initiative continuing and supporting it in the future,’ said Sara Mawhinney, Colmar Brunton. Social media analysis was undertaken by the National Bank. 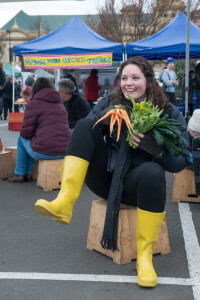 BOOTS FOR CHANGE attracted the support of 56 farmers’ markets showcasing fresh farm direct produce from 3000-plus farmers and artisan food producer stallholders. 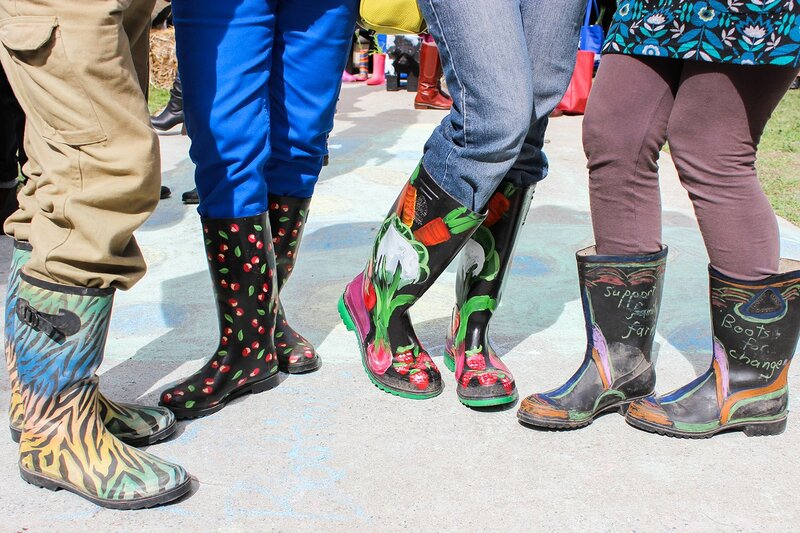 BOOTS FOR CHANGE Markets ran in all states, a total of 96 market days. 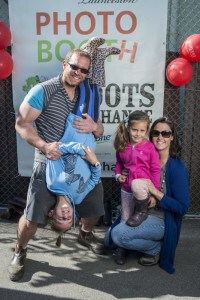 ‘Boots For Change was successful in both highlighting and celebrating our farming families and the pivotal role that farmers’ markets play, especially in regional communities,’ said AFMA campaign organiser, Jane Adams. Given the success of the inaugural campaign AFMA is intending to secure BOOTS FOR CHANGE as its biennial national awareness campaign. 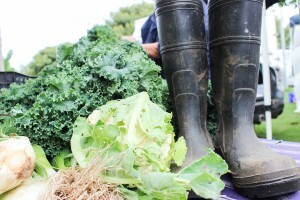 The next BOOTS FOR CHANGE initiative will roll out in Australia’s burgeoning farmers’ market sector in April 2018. BOOTS FOR CHANGE was supported by foundation partners FRRR and ABC Heywire. Additional generous support was provided by Platinum Boot partner Blundstone Australia, Silver Boot partners Colmar Brunton and the National Bank, and Bronze Boot partner Bruny Island Cheese Co. Thank you to the 55 farmers’ markets that embraced BOOTS FOR CHANGE and ran 96 BOOTS FOR CHANGE Market Days during April all across Australia from Margaret River to Hobart and Toowoomba. 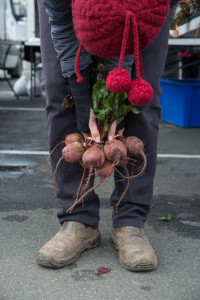 Over 3000 farmer stallholders participated at these markets that were visited by over 150,000 shoppers hungry for farm fresh, local, seasonal and healthy food. 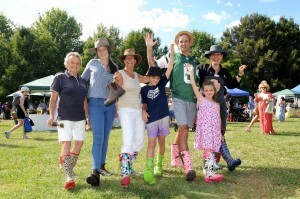 You all pulled on your boots and strode down to market to support Australia’s hard-working farming families. 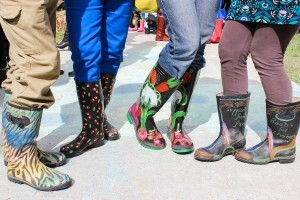 Conversations were started, stories told, boots were tossed, painted, planted, photographed and danced; some were even baked. 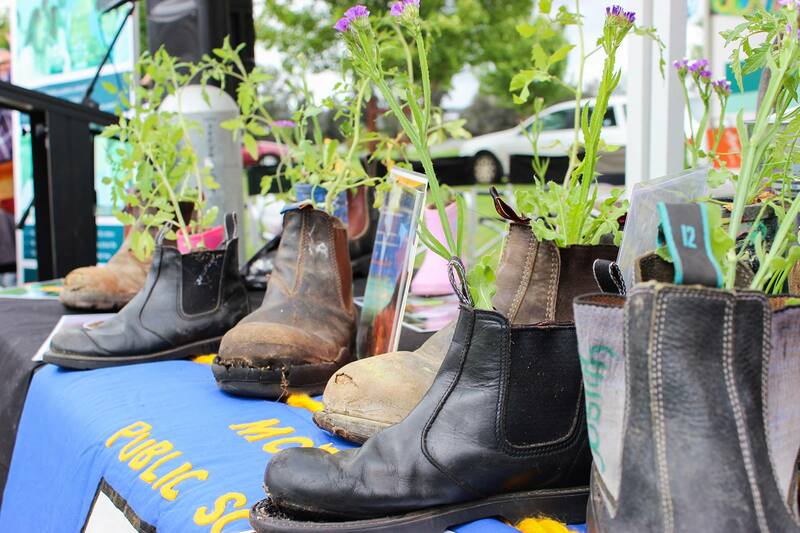 Kids paraded their boots, coloured them, turned them into herb planters. Dogs fell asleep in boots, others went walkabout, some looked near the end of life, other shone their city origins. Boots have been telling stories all through April – and they have connected people, communities and ideas. So it seems BOOTS do have the capacity to initiate CHANGE. Thank you Emma Mott and the 2015 Heywire team for booting up 🙂 the idea. 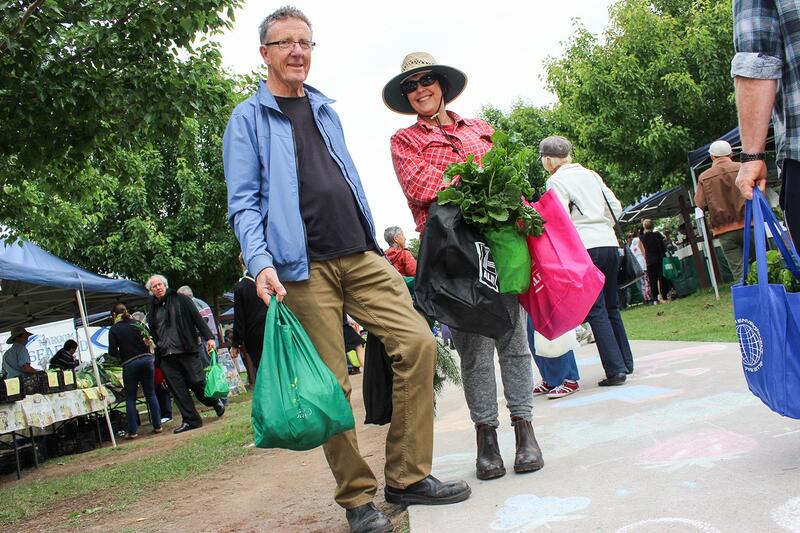 Thank you market managers and market stallholders for embracing the idea – and thank you over 150,000 farmers’ market shoppers for pulling your boots on in solidarity with our farming families. Take a big boot bow everyone – you have been amazing! Over fifty farmers’ markets in all states are hosting 90-plus BOOTS FOR CHANGE Market Days during April 2016. 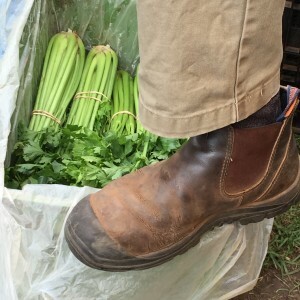 Some markets are donning their boots once to support their local farming families, while many weekly markets will boot-up every market day during April. 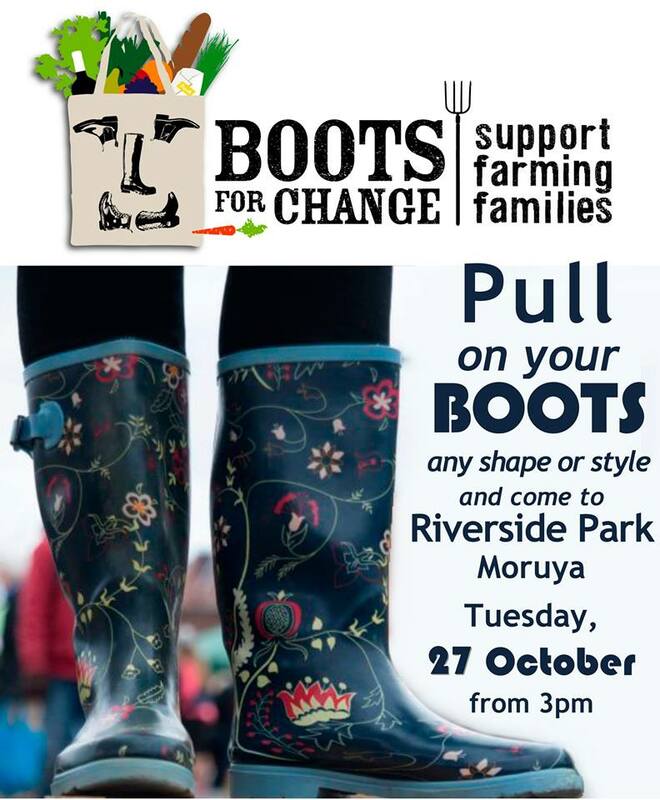 All BOOTS FOR CHANGE Market Days will celebrate Australia’s hard-working farming families and engage communities in conversations about the benefits of paddock-plate food supply, farmers’ markets and local, seasonal eating. BOOTS FOR CHANGE is a national activation of a 2015 ABC Heywire Youth Innovation Summit project. 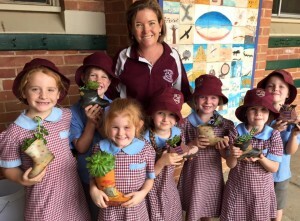 St Joseph’s Primary, Finley NSW, have potted boots for a school fundraiser at their BOOTS FOR CHANGE Farmers’ Market on 2 April. Meanwhile who’s got a pair of boots to match these?? 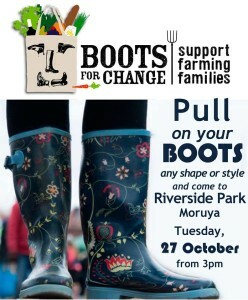 Check back here soon for a final list of all the BOOTS FOR CHANGE Markets. 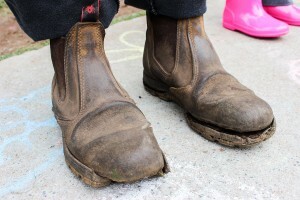 And for news from the campaign Platinum Sponsor – Blundstone. 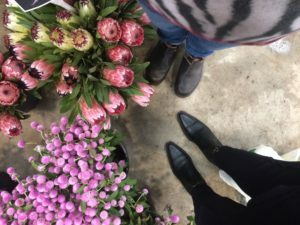 Listen to ABC reporter Josh Becker’s interview with Jane Adams – talking about the Australian Farmers’ Markets Association’s launch of the BOOTS FOR CHANGE campaign in farmers’ markets from Margaret River,WA to Tallarook, VIC. It first went to air on NSW Country Hour. ABC Radio is the official media partner for BOOTS FOR CHANGE – and regional stations will be putting their best boots forward too, to connect their communities to the Heywire initiated BOOTS FOR CHANGE farmers’ markets events running during April. 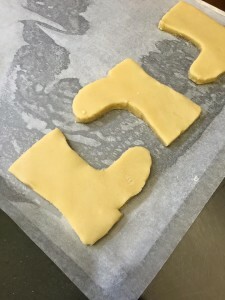 The BOOTS FOR CHANGE campaign is ready to roll out across Australia’s farmers’ markets in April, a dream come true for two of the Heywire team who conceived the idea, Emma Mott, Bega NSW and Melissa Kelly, Ravenshoe, QLD. 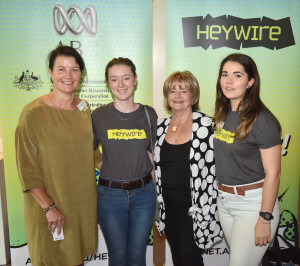 They attended the Heywire alumni accelerator program and met with AFMA’s Jane Adams to finalise implementation of elements of the BOOTS FOR CHANGE campaign. 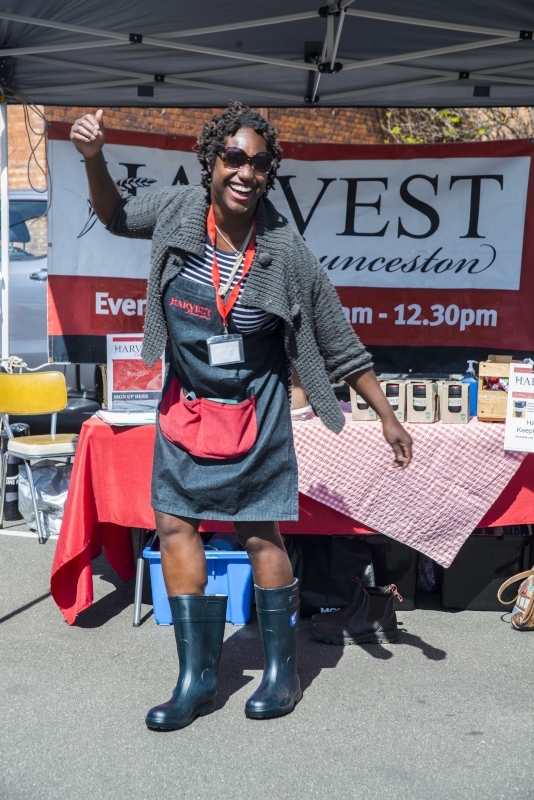 Hop back here for regular updates on BOOTS FOR CHANGE activities that will unfold at farmers’ markets across Australia in April 2016. Before many of Australia’s Farmers’ Markets kick up their boots in April 2016, two award-winning Australian farmers’ markets ‘tried on’ several Boot-driven activities during October 2015. 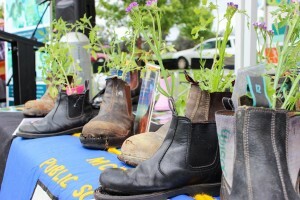 Australia’s most awarded farmers’ market went all out for their pilot BOOTS FOR CHANGE Market Day. 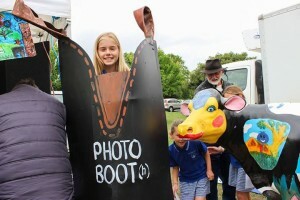 The Photo Boot[h] was very popular. So too the Boot Parade and Instagram ‘best boot’ competitions, colourful cows, and promotion of agricultural careers by the Year 9 students of the local agricultural high school. 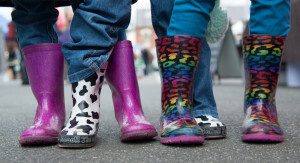 BOOTS FOR CHANGE month rolls out nationally in April 2016.